Diabetes is a disease that can affect many parts of the body, including the blood vessels in the eye. Initially, high sugar levels cause the blood vessels to become leaky, which results in blood and protein spilling out of the vessels and onto the retina. The retinal damage that ensues is known as retinopathy. If the leakage is near or in the macular region, the region that provides detailed, straight-ahead vision, declining eyesight will be noted. In the later stages, the weak vessels cause release of chemicals that initiate new vessel growth. Unfortunately these new vessels are defective and leak and bleed significantly more than the old ones. They can cause bleeding in the retina, as well as fill the entire eye cavity with blood. They may also cause aggressive scarring, which can result in a retinal detachment and blindness. 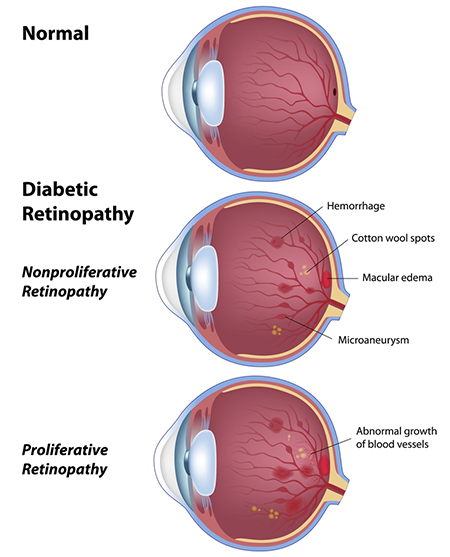 Treatment of diabetic retinopathy depends upon where the damage is occurring as well as its stage or progression. A fluorescein angiography (FA) provides a detailed image of which vessels are leaking and the extent of the leakage/swelling. It is performed by injecting a dye into the arm; the dye travels through the vessels in the eye and identifies the weak areas in all the vessels, while a camera or computer captures these images. Treatment is based on the findings of the FA. It may consist of laser to seal single leaking vessels in the early stages or the laser treatment may be much more extensive when retinopathy has reached later stages. Another treatment consists of injections in the eye to decrease the leakage and chemical drive to create new (but very defective) vessels. Diabetes is also linked to cataract formation and glaucoma. It is extremely important for all diabetics to have a dilated eye exam at least once a year. Castleman Eye Center has a retina specialist on staff to monitor and treat all types of diabetic patients. This convenience is greatly appreciated by many patients.